The New Orleans Saints and defensive end Cameron Jordan have reached an agreement on a five-year contract extension worth up to $60 million. The 25-year-old, who has been in negotiations with the Saints for over a year, was entering the final year of his rookie deal after New Orleans picked up his fifth-year option last summer. It is understood that Jordan, who has compiled 28 sacks over the last season--including a career-high 12.5 in 2013--will earn over $33 million in guaranteed money. 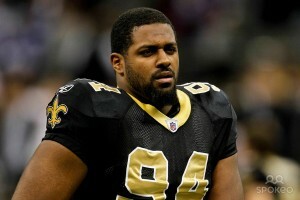 Cameron Jordan has signed a new five-year deal with the Saints. Jordan is a key piece of the puzzle in defensive coordinator Rob Ryan's scheme. Able to put pressure on the quarterback while proving stout against the run, Jordan graded out as a top 4 3-4 defensive end in 2013 according to Pro Football Focus. Following his second professional season in 2012, Jordan was among the few bright spots for the Saints' much maligned defense as he finished the year ranking near the top of the league's 4-3 ends in PFF's run stop percentage grades. Though his sack numbers dipped in 2014, Jordan continued to put pressure on opposing quarterbacks by way of hurries, and continued to perform well against the run. The Saints have been working to solidify their defense-the front seven, in particular- after a disappointing season in which they ranked near the bottom of every defensive category. Jordan, Akiem Hicks, John Jenkins and Junior Galette, who signed an extension of his own last fall, give the Saints' front a strong nucleus of young, developing talent. The likes of Glenn Foster, Ronald Powell and rookie Stephone Anthony provide further supplement for a unit trying to trend back towards its 2013 self, when New Orleans put their 2012 nightmares behind them and won a playoff game. Jordan's new contract allows the Saints to continue to build around him and their other talented youngsters such as Hicks, Galette and safety Kenny Vaccaro. The Saints brought in cornerback Brandon Browner in free agency to help shore up the secondary, while Jairus Byrd returns after an injury-marred first season in New Orleans. Veteran linebackers Anthony Spencer and Dannell Ellerbe were also brought in to help bolster the front seven. With improved secondary play and a strengthened interior line, Jordan can get back to what he does best - rushing the passer. The 2013 Pro Bowler showed his durability last season, starting all 16 games and finishing with 65 tackles (38 solo), 7.5 sacks, the first interception of his career, five passes defensed and one fumble recovery. For his career, the former Cal Bear has recorded 63 starts with 119 tackles, five forced fumbles, and 29 sacks.